Although seniors often take a lot more time to exam,and require more testing, your fee will not increase. Eye Doctors 100% dedicated to your needs. Eye care and eye doctors 6 days a week. The premise is we all want health eyes to enjoy our senior years . Our eyes are what drives us though out the day and its important to take care of our aging eyes. First Get A Comprehensive Eye Exam. Everyone age 50 or older needs a comprehensive eye exam Many eye diseases have no early warning signs or symptoms, but a Spectrum comprehensive exam can detect eye diseases in their early stages before vision loss occurs. Early detection and treatment can help you save your sight. Even if you aren’t experiencing any vision problems, visit us for a comprehensive eye exam and we will tell you how often you need to have one depending on your specific risk factors. At a time when you might not make appointments as frequently, seniors need regular eye exams more than anyone else. Yearly eye exams become much more important as we age. Eye problems can strike at any age as seniors are more likely to suffer from glaucoma, cataracts, or macular degeneration than any other age group. Increased disease risk in addition to the constant problem of changing eyesight makes it crucial for seniors to schedule an eye examination yearly once they reach the age of 60. Just as our physical strength decreases with age, our eyes also exhibit an age-related decline in performance particularly as we reach our 60s and beyond. That's why The Spectrum Eye Centre gives special attention to seniors. We provide a thorough eye exam tailored for your needs. When Do Age Related Vision Changes Occur? Cataracts. Even though cataracts are considered an age-related eye disease, they are so common among seniors that they can also be classified as a normal aging change. According to Mayo Clinic, about half of all 65-year-old North Americans have some degree of cataract formation in their eyes. As you enter your 70s, the percentage is even higher! It's often better to have cataracts removed before they advance too far. Also, multifocal lens implants are now available. 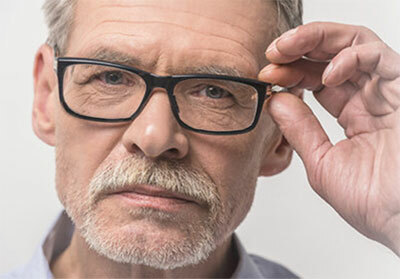 These advanced intraocular lenses (IOLs) potentially can restore all ranges of vision, thus reducing your need for reading glasses as well as distance glasses after cataract surgery. Macular degeneration. Macular degeneration (also called age-related macular degeneration or AMD) is the leading cause of blindness among Canadian seniors. Currently, there is no cure for AMD, but medical treatment may slow its progression or stabilize it. Glaucoma. Your risk of developing glaucoma increases with each decade after age 40 – from around 1% in your 40s to up to 12% in your 80s. The number of Canadians with glaucoma is expected to increase by 50% (to 360,000) by the year 2020. If detected early enough, glaucoma can often be controlled with medical treatment or surgery and vision loss can be prevented. Diabetic retinopathy. Over 1 million Canadians over age 40 are known to have diabetes. Many experts believe that up to 30% of people who have diabetes have not yet been diagnosed. Among known diabetics over age 40, it is estimates that 40% have some degree of diabetic retinopathy, and one of every 12 people with diabetes in this age group has advanced, vision-threatening retinopathy. Controlling the underlying diabetic condition in its early stages is the key to preventing vision loss. Loss of peripheral vision. Aging also causes a normal loss of peripheral vision, with the size of our visual field decreasing by approximately one to three degrees per decade of life. By the time you reach your 70s and 80s, you may have a peripheral visual field loss of 20 to 30 degrees. Because the loss of visual field increases the risk for automobile accidents, make sure you are more cautious when driving. To increase your range of vision, turn your head and look both ways when approaching intersections. Vitreous detachment. As we age, the gel-like vitreous inside the eye begins to liquefy and pull away from the retina, causing "spots and floaters" and (sometimes) flashes of light. This condition, called vitreous detachment, is usually harmless. But floaters and flashes of light can also signal the beginning of a retinal detachment – a serious problem that can cause blindness if not treated immediately. If you experience flashes and floaters, see your eye doctor immediately to determine the cause. A healthy diet and wise lifestyle choices – including exercising regularly, maintaining a healthy weight, reducing stress and not smoking – are your best natural defences against vision loss as you age. Also, have regular eye exams with to catch conditions in an early stage.